Point Pleasant senior Tucker Mayes swings at a pitch during an April 30 baseball game against Buffalo in Point Pleasant, W.Va.
Point Pleasant junior Carter Smith delivers a pitch during an April 25 baseball game against Wayne in Point Pleasant, W.Va.
CHARLESTON, W.Va. — Good things come in threes. 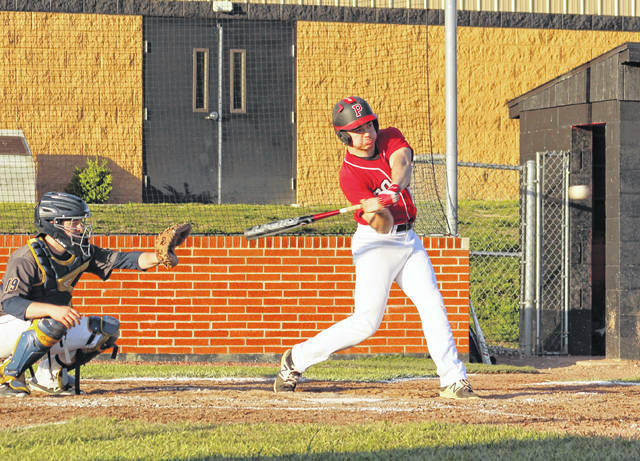 Point Pleasant landed three players on the West Virginia Sports Writers’ Association Class AA all-state baseball teams for the 2018 campaign — as voted on by a select panel of media members throughout the Mountain State. Senior Tucker Mayes, as well as juniors Miles Williams and Carter Smith, all earned all-state selections for the first time in their respective baseball careers. Both Mayes and Williams were named special honorable mention, while Smith was selected as an honorable mention choice. Williams — a catcher and utility player — hit .408 and scored a team-best 28 runs while producing 31 hits, two homers and 17 RBIs. Mayes — a utility player — hit .375 and had a team-high five homers while knocking in 27 RBIs and scoring 22 runs. Smith — an infielder — had a team-best .494 average and scored 25 runs while producing 38 hits and 18 RBIs. 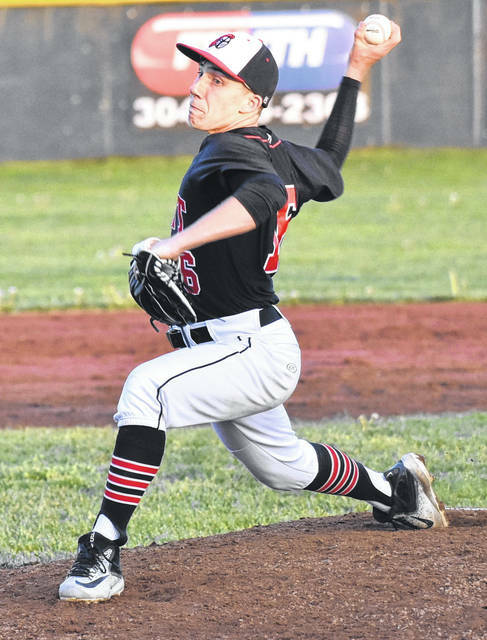 Bridgeport senior Brayden Lesher — a pitcher — was named the first team captain, while Nitro senior Mike Stone — a utility selection — was chosen as the second team captain. Pitchers: Tyler Komorowski, Weir, Jr; Brayden Lesher, Bridgeport, Sr (captain); Wyatt Milum, Wayne, Fr. Catcher: Kobie Carpenter, Lincoln, Sr.
Infielders: Zack Whitacre, Frankfort, Jr; Cayden Ross, Wayne, Sr; Brett Morris, Winfield, Sr; Koby Kiefer, Bridgeport, Sr.
Outfielders: Jaden Kuroski, East Fairmont, Sr; Noah Dingess, Chapmanville, Sr; Blake Wasson, Frankfort, Sr.
Utility: Fisher Horton, Independence, Sr; Grant Mohler, James Monroe, Sr; Ethan Payne, Poca, Fr; Caden Carpenter, Sissonville, Sr.
Pitchers: Matt Gainer, Elkins, Jr; Logan Stump, Independence, So; Nick Edwards, Winfield, Sr.
Catcher: Logan Lawhorn, Oak Hill, Fr. Infielders: Tre Junkins, RCB, Sr; Jacob Oates, Braxton County, Jr; T. Jay Mullins, Logan, Sr; Zach Perry, Wayne, Sr.
Outfielders: Broderick Lantz, Liberty Harrison, Sr; Justin Lovell, Shady Spring, Jr; Josh Adkins, Nitro, Sr.
Utility: Cole Barker, Lewis County, Sr; Nathan Kuhn, Scott, Jr; Matt Brown, Logan, Sr; Mike Stone, Nitro, sr, (captain). Jonathan Lyons, Oak Hill; Cam Cook, Wyoming East; Matt Caldwell, Wyoming East; Andrew Hazelwood, James Monroe; Connor Moore, James Monroe; Trenton Begley, Liberty Raleigh; Chris Begley, Liberty Raleigh; Nick Nutter, Nicholas County; Jared Gregory, Nicholas County; Noel Sizemore, Shady Spring; Jaedon Diggs, Bluefield; Luke Nash, PikeView; Derek Chapman, Herbert Hoover; Peyton Gillispie, Winfield; Conner Mullins, Chapmanville; Michael Pinkerton, Sissonville; Trad Harman, Petersburg; Jakob Mauzy, Petersburg; Tanner Champ, Petersburg; Nick Corwell, Frankfort; Wyatt Yates, Frankfort; Josh Cline, Oak Glen; Elijah Gillette, Weir; Payton Lockard, Braxton County; Corey Elswick, Clay County; Isiah Thompson, Wayne; Jeremiah Milum, Wayne; Chase Berry, Chapmanville; Devin Hensley, Logan; Justin Stone, Berkeley Springs; Andrew Butts, Berkeley Springs; Cole Kiddy, Robert C. Byrd; Hunter Moore, Lincoln; Chapin Murphy, Bridgeport; Tim Via, Bridgeport; Read Schumacher, Elkins; Luke Swecker, Elkins; Andrew Hamilton, North Marion; Dalton Boyce, East Fairmont; Ian Fairley, Fairmont Senior; Connor Neal, Fairmont Senior; Leo White, Lewis County; Luke White, Lewis County, Jaedon Diggs, Bluefield; Connor Moore, James Monroe; Andrew Hazelwood, James Monroe; Brock Muncy, Man; Miles Williams, Point Pleasant; Tucker Mayes, Point Pleasant; Carter Lyles, Scott; Dominic Lough, Grafton; David Shriver, Philip Barbour. Tanner Hall, Wyoming East; McQuade Canada, Wyoming East; Nick Lester, Independence; Monroe Mohler, James Monroe; Mikey Belcher, James Monroe; Josh Pritt, Nicholas County; Lane Jordan, Oak Hill; Bradley Lokant, Oak Hill; Caleb Lilly, Shady Spring, Jo Jo Brooks, Bluefield; Ben Price, Westside; Aaron Blackwell, Winfield; Jason Douglas, Nitro; Jake Hamrick, Nitro; Sam Ingram, Winfield; Isaac McClanahan, Poca; Tanner Miller, Poca; Cayd Snyder, Sissonville; Luke Stricker, Herbert Hoover; Rhett White, Herbert Hoover; Josh Zigmond, Chapmanville; Lucas Berg, Petersburg; Peyton Sindledecker, Petersburg; Brendan Whiteman, Frankfort; Reid Hoover, Weir; Tayton Stout, Braxton County, Colton Moore, Clay County; Jake Whiting, Roane County; Josh Perry, Wayne; Peyton Branham, Logan; Tobin Cain, Berkeley Springs; Jackson Tucker, Liberty; Tyler Pitzer, Bridgeport; Brice Haines, Bridgeport; Patrick Bart, Lincoln; Holden Santee, North Marion; Dylan Kincell, East Fairmont; Broderick Rohrbaugh, East Fairmont; Drew Sivak, Fairmont Senior, Cam Hines, Fairmont Senior; Jared Skinner, Lewis County; JoJo Brooks, Bluefield; Joseph Schmidlen, Elkins; Nick Jewell, James Monroe; Cody Moore, James Monroe; Evan Moreland, Keyser; Zack Frye, Man; Carter Smith, Point Pleasant; Aaron Epling, Scott; Nate Baldwin, Philip Barbour; T.J. Summers, Grafton; Eli Kirkendall, Lincoln County; Broc Crist, Lincoln County.